The principles discussed and illustrated here are the ones that have kept Clarence training to improve long after many others have lapsed into maintenance training or given up altogether. Wayne & Tina Gallasch and Clarence tell inspiring stories about themselves and their motivation. Wayne's story is about competition, the ultimate motivator. Wayne transformed himself from a fitness buff, lifting weights in his basement, to the world's best indoor rower at 500 meters for his age and weight. Clarence explains why personal achievement is the best motivator and how trying to keep up with Wayne almost sidelined him. Tina tells how discovering, to her great surprise, that she enjoyed indoor rowing and lifting converted her from a casual and unmotivated workout person to an avid trainer. 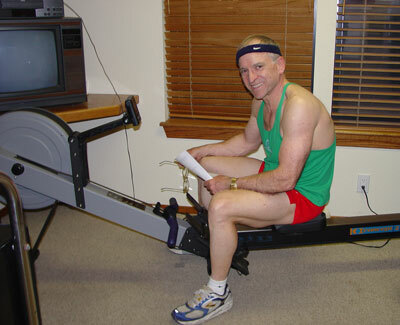 6 months later (in August 2004) Wayne lowered the Australian 500m indoor rowing lightweight record, 60-64 (still current in 2018) to 1:33.2, see video clip of the row here. Clarence Bass has three DVDs and they are all available as a special offer. Instead of buying them separately at $34.95 each, buy all three for $94.95 - now at the SPECIAL SET PRICE OF $79.95. For a full description of each DVD please click on the links below. 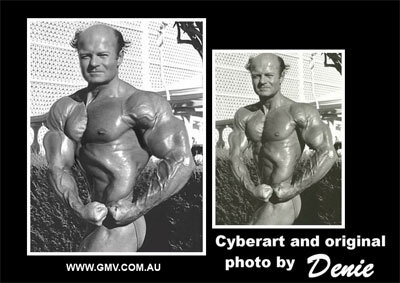 Clarence Bass, the living embodiment of the word "Ripped", has achieved unprecedented levels of lean muscularity through healthy living. Winner of his height division in the "Past - 40" Mr. America and Mr. USA (and "Best Abdominals", "Best Legs" and "Most Muscular", as well), his image and his principles of diet and exercise have led people around the world to stronger and healthier lives. 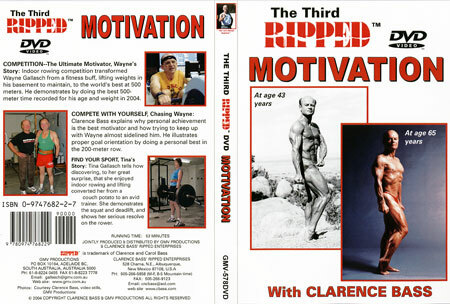 Feedback on The 3rd Ripped DVD: MOTIVATION. I liked how the viewer got all three stories -- Wayne's, yours and Tina's. Wayne is a fascinating guy, low-key but incredibly driven. He obviously is genetically gifted. Not many could advance as quickly as he has in this field. You can tell that this guy is strong just by how his biceps fill out the sleeves of his t-shirt! I like how he is able to combine his lifting with his rowing in a way that does not give short shrift to either. Your story was a good reminder of how we must compete within ourselves. I can see that it must have been hard for you to see your friend Wayne as a Johnny-come-lately step into this sport and ease past you so quickly. It seems that your initial reaction was, "He must just be working harder than me!" But I doubt that was the case -- Wayne simply has extraordinary genetic gifts, or so it would seem. Tina is delightful, because she comes across as the more ordinary "every-woman" type, and less intimidating to some than lifelong "hardcores" like you and Wayne. People see Tina, and they say, "If she can do it, I can do it." Dan, aka "Musclehead Law Professor". Check out the 10 books we have in stock by Clarence Bass click here. Please click here for the SPECIAL 3 BOOK DEAL, B-0289SP. To read a REVIEW on this DVD click here. Click here to read an article on Clarence Bass. Wayne's thoughts on rowing and his passion for competitive Concept 2 indoor rowing. Rowing is a very tough sport. The nature of rowing is that you are physically and mentally on the edge the entire race, or during each attempt at a new personal best time. Your aim is to row the last stroke that you can manage as you cross the finish line, in a state of near collapse. The sport of Rowing is not like most other sports. The pain and exhaustion you experience is actually created by yourself. You try to push yourself both physically and mentally beyond your limits. To read Wayne's article for Clarence Bass' SUCCESS STORIES section of his site, please click here. Clarence and Wayne in photos taken by Tina Gallasch on the final day of the shooting of this DVD. See Wayne's comments above on rowing "on the edge".